Rooftop solar PV systems consist of solar PV panels and balance of system, which comprises transformers, electricity systems, and monitoring and mounting equipment along with mounting and installing modules. Rooftop solar PV systems are increasingly getting popular as they provide off-grid and on-grid flexibility. The use of rooftop solar PV demand is spreading quickly in the emerging markets, the policy environment is providing optimal opportunity in the developed and developing geographies. The continuing growth and geographical expansion of solar PV demand has driven decline in solar modules prices globally, this further assisted in the capacity additions of solar PV additions. Rise in demand for renewable energy and the electricity generation adding the growth in the global solar PV market. Rooftop solar systems can be installed at various locations, such as household and commercial building rooftops and above parking spaces, using balance of system including inverters, transformers, wiring, and monitoring equipment, making them a convenient option. The Energy Payback Time (EPBT) for 2 kWp rooftop solar systems is around two to three years, thus making these systems an economically viable and efficient alternative. Distributed PVs (DPVs) with a capacity of less than 100 kW are preferred for rooftop solar systems. However, as the difficulties with FIT persist for DPV, solar leasing has gained popularity and is expected to boost the rooftop solar market. Rooftop solar continues to depend on different incentive mechanisms that drive the demand such as technology-specific renewable portfolio standards (RPS) and tenders, tax credits, traditional feed-in tariffs or Power Purchase Agreements (PPAs), as well as premiums for the feed-in of excess power generated in self-consumption systems. Rooftop solar systems are more suitable for self-consumption, i.e. electricity should be used at the site where it is generated. Transmission of solar electricity to other sites is less efficient for rooftop solar due to lack of smart grid infrastructure. Electricity trading is done for a limited amount of electricity due to the absence of infrastructure. Although net metering has been implemented in almost all the major rooftop solar markets. Net metering has attracted negative attention from other utilities, including fossil fuel utilities. Overall impact of these factors affects the implementation and adoption of rooftop solar systems and renders the market volatile. The situation for connecting new installations to the grid is very alarming. Customers in different geographies are struggling to understand solar commitment and targets by each government globally. Share of renewable energy in the global energy mix is rising at a substantial pace. According to the IEA, renewable energy accounted for only 13.2% share of the global energy mix market in 2012. However, its share rose to 19.3% in 2015. Solar and wind renewable capacities experienced maximum growth in 2015. The Paris Agreement enforces countries to strive toward keeping the rise of global temperature in the present century below 2°C. According to the IEA, a minimum of 75 GW of solar capacity was installed worldwide in 2016, which was a rise of about 48% from that in 2015. Decrease in production costs and advancements in technology of solar panels have the potential to reshape the rooftop solar PV industry. New players can enter the market through various ways such as different solar PV material, different solar PV cell type, and different range of PV manufacturing techniques. Rooftop solar is widely used in commercial and industrial buildings as it provides benefits such as economical cost, less complexity, avoiding of cost of land, etc. There has been a key uptake in various forms of renewable energy generation globally. Global commitment on climate change mitigation under the Paris Agreement in 2015 facilitated decreasing the short-term impact of oil prices by recognizing the longer-term benefits of renewables. The Paris Agreement has at present got the instruments of ratification, acceptance, and approval from the developed and developing countries each contributing in the renewable energy generation. In 2015, the UN General Assembly adopted the Sustainable Development Goals on Sustainable Energy for All initiative. Solar is considered as the main pillar for a future renewable energy based system. The solar industry well supported by the technology-specific renewable portfolio standards (RPS) and tenders, tax credits, traditional feed-in tariffs or Power Purchase Agreements (PPAs). Geographically, Europe accounted for the largest cumulative market share in terms of revenue and capacity for the rooftop solar PV market in 2016 and in the forecast period Asia Pacific is expected to dominate the market with high demand from countries like China, India, Japan, Australia and South Korea are the key contributors for the high demand for rooftop solar PV in the Asia-Pacific region. The market for DPV has been gaining ground, with high number of installations in developed countries such as Japan and the U.S. Moreover, Asia Pacific is expected to have significant installations for solar rooftop PV market during the forecast period. The highest growth during the forecast period is registered owing to the increasing demand for solar energy as well as initiatives taken by governments of different countries. The recent expansion of the rooftop solar capacity in the region is expected remain high due to the promotion policy which has affected overall cost on the current system costs. 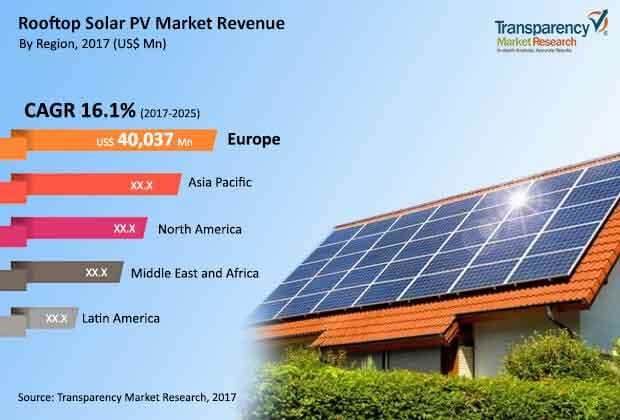 Key players in the Rooftop Solar PV market include Sharp Corporation, Trina Solar, Pristine Sun LLC, Solimpeks Corporation, Kyocera Corporation, JA Solar Co. Ltd., Yingli Solar, Vikram Solar, Canadian Solar Limited, RelyOn Solar Pvt Ltd. and Sunshot Solar Co. Ltd. This report analyzes and forecasts the market for rooftop solar PV at the global and regional level. The market has been forecast based on revenue (US$ Mn) and volume (MW) from 2017 to 2025. The study includes drivers and restraints of the global rooftop solar PV market. It also covers the impact of these drivers and restraints on demand for rooftop solar PV during the forecast period. The report also highlights opportunities in the rooftop solar PV market at the global, regional and country level. The report comprises a detailed value chain analysis, which provides a comprehensive view of the global rooftop solar PV market. Porter’s five forces model for the solar rooftop PV market has also been included to help understand the competitive landscape in the market. The study encompasses market attractiveness analysis, wherein end-users are benchmarked based on their market size, growth rate, and general attractiveness. The study provides a decisive view of the global rooftop solar PV market by segmenting it in terms of application. These segments have been analyzed based on present and future trends. Regional segmentation includes the current and forecast demand for rooftop solar PV in North America, Europe, Asia Pacific, Latin America, and Middle East & Africa. The study includes profiles of major companies operating in the rooftop solar PV market. Key players in the rooftop solar PV market include Sharp Corporation, Trina Solar, Pristine Sun LLC, Solimpeks Corporation, Kyocera Corporation, JA Solar Co. Ltd., Yingli Solar, Vikram Solar, Canadian Solar Limited, RelyOn Solar Pvt Ltd. and Sunshot Solar Co. Ltd. Market players have been profiled in terms of attributes such as company overview, financial overview, business strategies, recent developments, and SWOT analysis. The report provides the estimated market size of rooftop solar PV for 2016 and forecast for the next nine years. The global market size of rooftop solar PV has been provided in terms of revenue. Market numbers have been estimated based on application segments of rooftop solar PV market. Market size and forecast for each application have been provided in terms of global and regional markets.